Poor Mouse! Her lifelong guardian had fallen and moved into a nursing home. 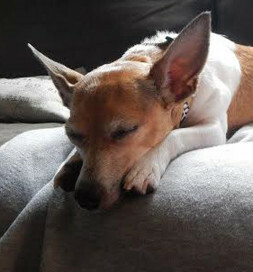 Mouse, a Rat Terrier, was turned over to the Neenah [Wisconsin] Animal Shelter. Things briefly looked up when she was adopted. But after two weeks, the management of the apartment complex where the adopter lived changed its pet policy to “no dogs,” and Mouse was returned to the shelter. How confusing it must have been for the loyal little dog. Mouse is sometimes as quiet as one. When Brittany Blankenheim saw Mouse on Petfinder, she made an appointment to meet her. The Oshkosh, Wisconsin, woman and her partner had been looking for a companion for their dog, Bosco, a Boston Terrier who was experiencing separation anxiety when left alone. Brittany, in particular, wanted to adopt an older dog, and at 5-1/2 years, Mouse fit the criterion. In spite of feeling rejected, she decided to leave the decision to Bosco. “We set up a meeting later that week at a local dog park,” Brittany says. “The two greeted one another and went their separate ways to smell and run. This was impressive because Bosco doesn’t like every dog he meets.” It was a good sign, and they adopted Mouse. Once home, Mouse quickly settled in and now even a look from Brittany sets Mouse’s little nub of a tail wagging. At mealtime, the dog gathers a mouthful of food, brings it to Brittany, spits it out, then eats one piece of kibble at a time until she has finished with that mouthful, and then repeats the process for the entire meal. As the days have passed, the way Mouse acted at their first meeting has become clearer to Brittany. “She must have known I had already fallen in love with her and she needed to impress my partner,” Brittany says. If so, then Mouse was right. The first look at those goofy ears and those big brown eyes had completely won Brittany’s heart.